It's hard to believe, but prior to Uncanny X-Men #279, I'd only read one X-book. Still from guest appearances, I knew who was awesome. 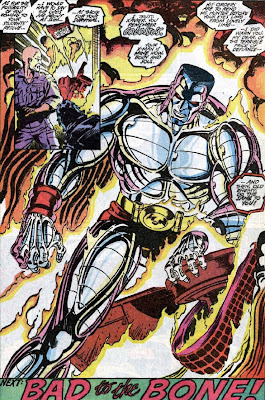 When #278 ended with a Paul Smith Terminator 2-ish splash page highlighting Colossus's return - albeit as a villainous puppet of some dude named The Shadow King - I knew he had set the stage for an issue above all previously recorded levels of 'awesome' - and it was. #279 is part of the Muir Island Saga, which basically unites the X-Men with X-Factor, just a few issues before the 90's blue and gold teams debut. 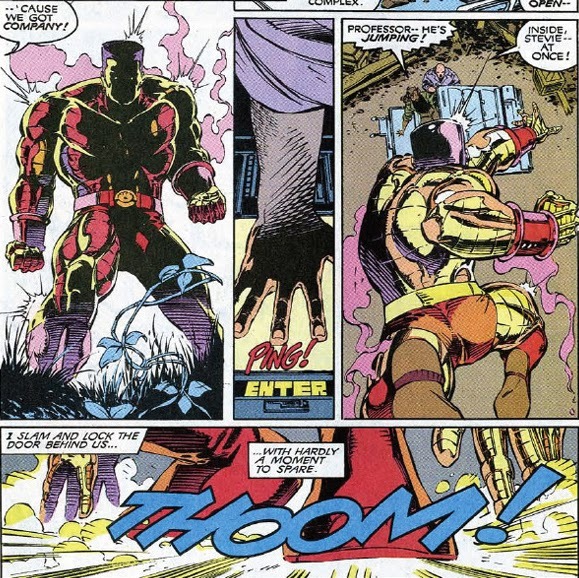 The reason why I chose to highlight this issue, not the story-arc is because A) I'm a freak for Colossus, and B) this issue is the X-Men's version of The Shining. The artistic team for the issue as you can see changed, with 'guest penciller' Andy Kubert stepping in. 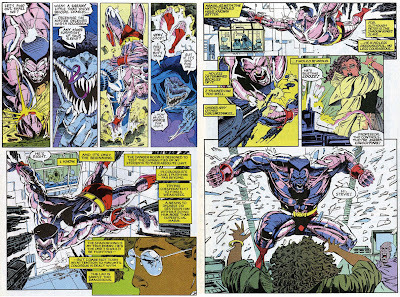 1991 was the same year Andy would help produce Batman vs Predator, so the chase scenes he drew here no doubt came in handy, let alone prepared him for his future definitive X-run! As for where the other X-Men are in the Professor's moment of peril, over on Muir Island, Forge fights to free possessed X-Man Wolverine, as Gambit, Rogue and Jubilee who have fallen victim to Shadow King's global negativity manipulations close in. How sweet is that last panel? 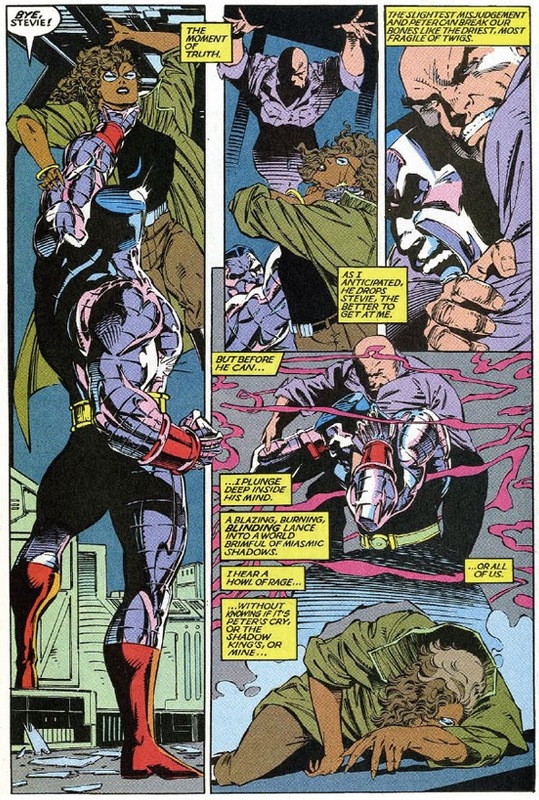 I swear, to highlight how badass a character is, have him go evil for an issue or six - it's the only way. Did you click to enlarge - The Shining's 'Here's Johnny!' was never done better in comics than here. The pacing of the book gets a helpful credit to Jim Lee, but I think that in part can also go to Fabian Nicieza, who keeps things a little more clipped than co-writer Chris Claremont was lone to do - even with Chris's plentiful exposition boxes in play. That 'Bye Stevie' has to by the creepiest good-bye in comics, up until Bizarro met the All-Star Squadron in DC's Infinite Crisis. Relive the chase and get the answer by tracking down Uncanny X-Men #279 from your top comic supplier. What do you think? Do you remember this issue? Sometimes it feels like after this no one knew what to do with Colossus if he wasn't turning bad. And they did it so well here, making a truly gentle soul into this being of pure rage, I can almost understand why. I remember yelling "No! Not Stevie!" at the comic. I loved Stevie. Who didn't frakking love Stevie? And I had to get over being pissed about that before I liked the X-Men again. Thanks Random! 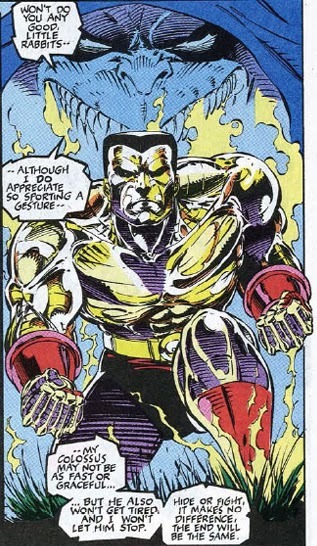 I dug seeing Colossus back. His nature and look may not make him the X-Man with the richest history, but he is one of the best and most noblest. That's why this struck me so much I reckon, it was like if Pete's soul could be corrupted - anyones could. I actually just got this one myself(well won it recently in a trivia contest at my shop) but yeah, awesome scene here and throughout the entire isssue. The Muir Isle saga ended alot differently than Claremont intially intended. But I think the final ending wasn't bad at all, and we got a re-crippled Prof. X out of the deal. Hardcase Dale, I'm actually reading a book now on what Chris was originally hoping for the X-Men, I knew a lot of it already, but tis the dangers of 'work for hire' writers I guess. Glad you liked the issue too. Thank you, thank you, thank you soooo much. 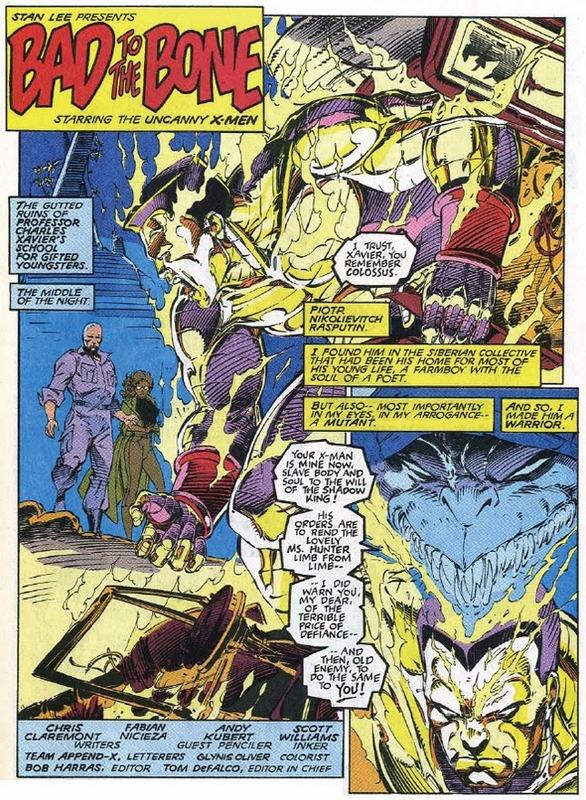 Just like you, I had a paltry understanding of the x-men pre-279, however, I had always favored that guy that could transmute his flesh into indestructable organic steel. 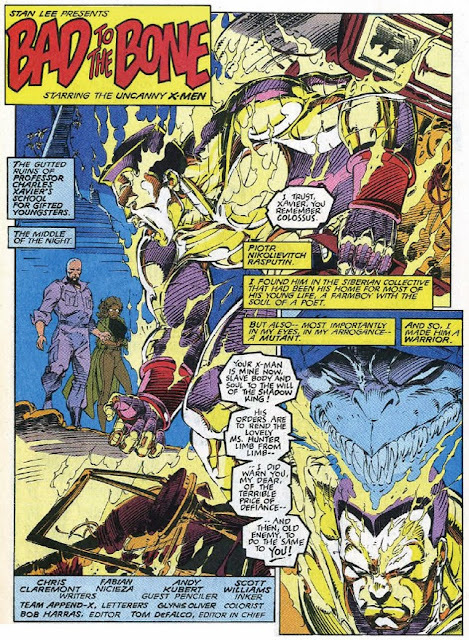 Issue 279, the whole Muir Island Saga, notwithstanding, set the stage for the 90's x-men. This, with the exception:Colossus and NightCrawler, together, fighting the Sidri bounty hunter creature in their X-Caliber days, was Colossus's finest moment. Sadly, after this issue he never again achieved that level of perfection again. Hey Anon! Thanks for stopping by IADW and thanks even more for taking the time to leave a few words! You are completely right about setting the stage for the 90's X-Men. 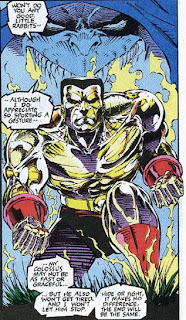 I was glad when Colossus returned in Uncanny X-Men to the side of the angels, then split for Kitty over in Excalibur. Hopefully Claremont gets to do the same when he opens up the upcoming Nightcrawler ongoing series. What do you think?